Mineral dolomite crystals, applied in the earth alkali activation of the fly ash. Composition CaMg(CO3)2. 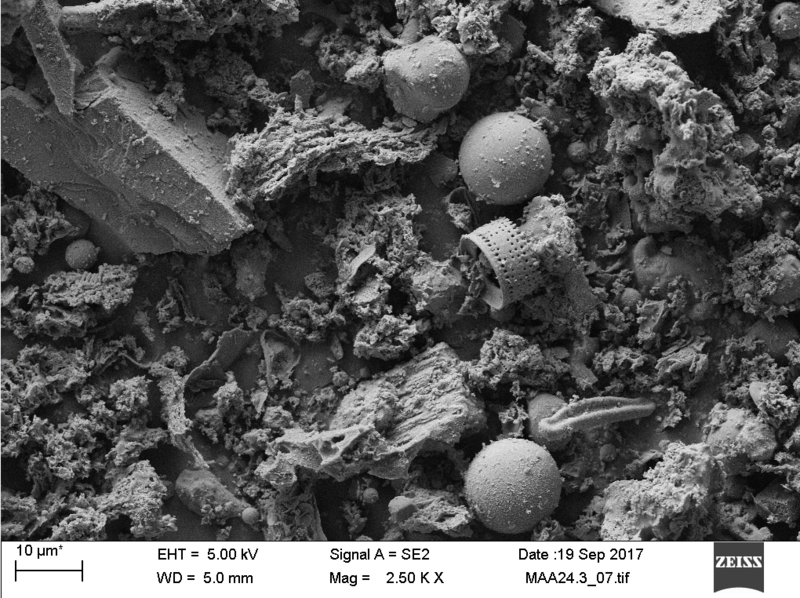 Perforated shells of elongated, tapering diatoms (SiO2) embedded in the other earth alkali activated fly ash particles. Origin: peat fuel component. Stable over fluid bed operating temperature. Glassy spheres embedded in the other fly ash particles. Perforated diatom cylindral capsule (SiO2) embedded in the other fly ash particles. Detail of a diatom shell. Hundreds of thousands tons of fly ashes from wood, field cultivation residues, peat and waste incineration processes are landfilled or applied in low value applications in Finland. Earth alkalising the fly ashes, formed inside the combustion process, produces the possibility to apply the ashes, such as in (organic) field- and forest-fertilizers, as well as apply the otherwise hazardous ashes in the road and disposal site foundation engineering and tailing pond engineering (after mining operations). Other applications like scrubbing sulphur compounds from biogas, remedy of natural acid soils as well as contaminated soils, are possible. Additionally, earth alkali activated fly ashes can be applied as a raw material in structural and construction materials, for example in geopolymers. Last but not least: EAA can be applied to improve boiler phenomena, which can be greatly improved aside when the ashes are added. The combustion process is improved in a variety of ways, air pollutants are reduced, nutrients circulation is improved. There are five different application ecosystems defined that are connected to this proposed technology: nutrients related, boiler phenomena, binder applications and the broad field of environmental applications. The first industrial trials have been made during spring 2017, the analysing step is underway, so far the results obtained are as anticipated. ** Examples of boiler phenomena are 1. Boiler metal corrosion and fouling (= the boiler gets dirty inside due to sticking of alkali chlorides e.g. on the superheater tubes), 2. Sintering taking place in the fluid bed material, 3. Ash-fluid bed material interactions, 4. The efficiency of pyrolysis, 5.Oxidation of the fuel (possibly aided by the fluid bed material), 6. The interaction of fuel contained harmfull constituents and fluid bed material. Reduction of raw materials: Fertiliser raw materials are replaced with earth alkali-activated ash (EAAA), as well as with nitrogen (N) containing gasification residues (GR) (from another processes producing biogases), which may be combined with ash while pelletising the ash into non-dusting form. Virgin raw materials like phosphate rock are replaced and very energy intensive nitrogen fertilizer production will be replaced. The EAAA contains nutrients Mg, Ca, P (phosphorous), K (potassium), Cl, S, Si (silicon) and beneficial trace metals. The ash does not contain nitrogen (N from the fuel is derived into the combustion gas). Reduction of emissions and particulate matter: NOx (nitrogen oxides) and CO (carbon monoxide) deriving from the fuel are decreased due to the enhanced combustion process (pyrolysis phenomen is calalyzed by earth-alkali metal oxides formed in the combustion process). Cl and S are shifted from the combustion gas to the fly ash formed. (by term ash I allways refer to ”fly ash”, if not otherwise stated). Reduction of repair costs. The corrosion of the valuable boiler metal materials is reduced while combusting especially alkali-rich, moist-dense fuels like wood chopping residues containing green mass like fir and pine needles, field cultivation residues and waste derived fuels. Other. Solely in Finland the amount of beneficiated fly ashes may be greatly increased due to the fact that the ashes from different fluidised bed combustion processes applying various kinds of fuel mixes are strongly homogenised during the earth-alkali activation (the chemical and phase composition as well as the structural and morphological properties of the ash material will become equalized). This enables the more extensive use of fly ashes in various applications, and gives way to new kind of standardisation of ashes. Emissions into air, water and soil are reduced due to the fact that the combustion process is more effective: less CO, NOx, fine particulates, chlorinated hydrocarbons, sulphur and halogen compounds in the smoke gas [= combustion gas containing all the gases (mainly CO2, N2, H2O) and particulate matter from combustion process]. For example, sulfur (S) and chlorine (Cl) are transmitted into the ash, such as ion in the form of earth alkali [= element Ca aor Mg (calcium and magnesium)] or alkali sulphates and -chlorides, rather than into the smoke gas, whereby S and Cl act as a nutrient in the ash if applied as a fertiliser or a raw material. The main challenges are financial and regulatory. Circular economy has really challenged the legislation in a way many laws, regulations and decrees should be modified or replaced. Government officials face problems in their interpretation since there are e.g. no decisions made at the supreme court. These issues are connected e.g. to the matter if a material is a waste, product or by-product. Some wastes enhance the ash quality (when applied as a fertiliser) but the legislation prevents this like ash application as a fertilier since it is prohibited if “waste “is applied as a fuel or a component of a fuel. “The end of waste” procedure is very paintaking to put through in EU. This concerns the interface between waste-, chemical (including REACH), fertiliser- and environmental legislation, only few to mention. The financing of this like entity, demanding a substantial amount of funding due to the big need for research, is a big challenge, especially for an SME party. This like opening may however include a major positive impact onto civil matters so public funding has its grounds. Also, e.g. patenting costs are quite high. Oulu University, The Central Osthrobothnia university of applied sciences (CENTRIA), Juuan DolomiittikalkkiOy, Nivalan Kaukolämpö Oy, Laihian Nuukalämpö Oy, Eneferm Oy, Oulun Energia Oy etc. – The second party is the energy company running fluidised bed combustion process (e.g. Nivalan Kaukolämpö Oy). Of course a big number of energy companies is desired. The combustion process applies earth-alkali carbonates (earth-alkali activation) as the fluid bed material. The fluid bed process may be so called bubbling fluidised bed process or circulating fluidised bed process. These differ from each other in the unit size and fuel efficiency, but also somewhat in of the technical details. – The third party may be the organization to collect the EAAA, pelletise it and optionally combine the pelletised EAAA with GR (from the fourth party (like Eneferm Oy or rather its customers) or several of those. – The fifth party may be the one that markets and distributes the EAC (earth alkali carbonate fluid bed material) to the energy company). E.g Fescon Oy. – The sixth party may be e.g. the wholesaler (or several of those) specialised to agriculture and/or forestry (e.g. Hankkija Oy). – The seventh party may be a company giving logistical services. – The ninth party may be a consortium of research institutes and universities (E.g. Oulu university and Centria). – The tenth party is Biominerals Oy (BMOY) that owns the IPR matters, coordinates the functions between the various parties, acts as the main coordinator of R&D as well is actively seeking for funding. The earning logistics of BMOY is to collect licence-based income for the rights it permits for the right to use its technology. The licence fees may be collected essentially from energy companies which get benefit with less corrosion in the boiler, better process reliability, less emissions, easily getting rid of ashes formed, more effective combustion process, and lowewr overall costs (CAPEX + OPEX). – Other parties may consist of fluidized bed combustion plant designer or production companies, analytical service offering companies. – In this description, the parties supplying fuels to the energy company are omitted. Some of the parties mentioned can take several of the duties mentioned under its arms. For example, the one to collect and improve the ashes, may also act as the supplier and improver of the fluid bed material. Furthermore, the core unit of the whole loop can be arranged into a ”leasing” form, for example the energy company would neither pay for the fluid bed material nor for the small investment required for additional fluid bed material silo, possible bigger ash silo, analysing duties of the combustion gas and/or ashes. The ”supplier” may take care of all these things and would get paid for a certain amount of energy produced by the fluid bed boiler/combustion in question. The same principle may be applied while marketing the fertiliser (the farmer or forest owner would not pay per kilogram of the fertiliser, but rather for the growth result).